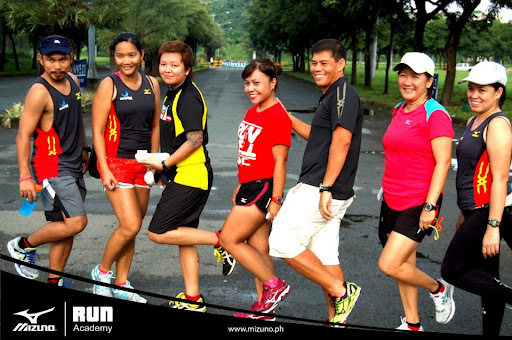 After being postponed for almost a month because of the recent flooding in the Metro, the Mizuno RUN Academy graduation finally pushed through yesterday. 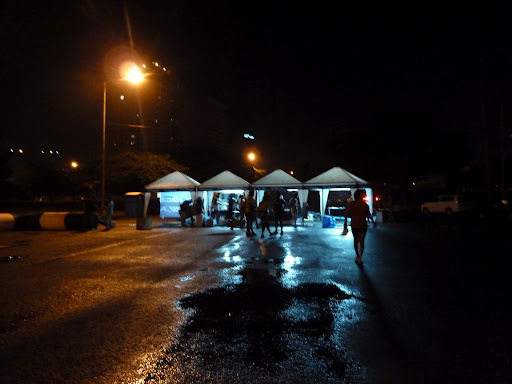 Students from Alabang, MOA and BGC and their guest runners came at 4:30am to Filinvest, Alabang for registration. My younger sister came with me. They made all students wear Mizuno vests. I looked fat in neon orange, haha! Coach Patrick gave an opening speech and then at 5:15 we were off! 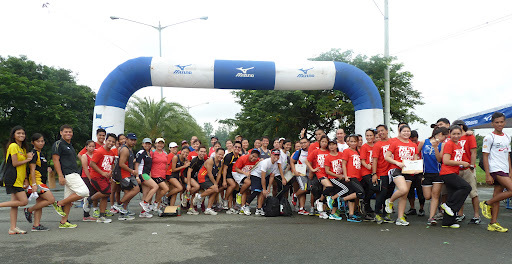 The distance was 10K, 2 loops of 5K around Filinvest. I was familiar with the route. That was where we held our classes and where I run almost every Saturday afternoon. 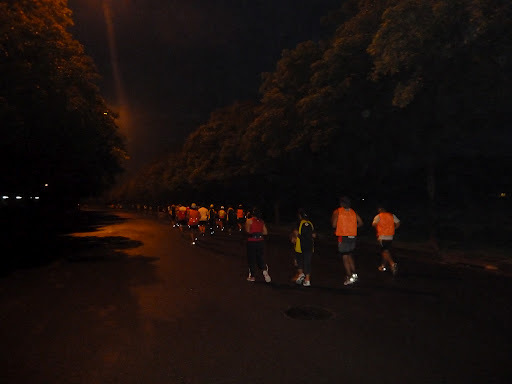 I like running there because some roads are closed to traffic and there are lots of trees. 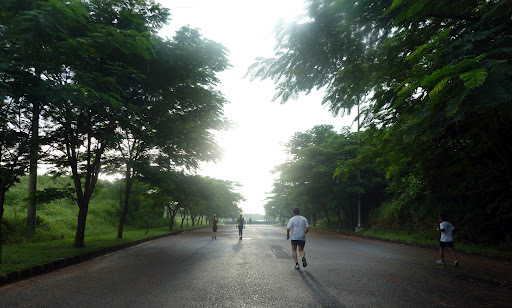 Last Sunday was my first time to run around Filinvest in the morning, it was quite a different experience. 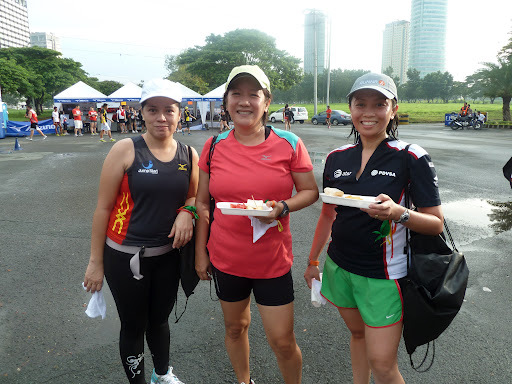 They gave us cold towels and 2 loot bags after crossing the finish line, 1 from GNC and the other from Gatorade. Then my sister and I headed to the tent where breakfast was served. I was starving! Breakfast was cheese pimento mini sandwiches, crackers with cheese dip, carrot sticks, apples, watermelons, Gatorade, GNC protein drink in vanilla and chocolate flavors. After breakfast we had a short program. First, a question and answer portion. The student must run to the microphone and answer. 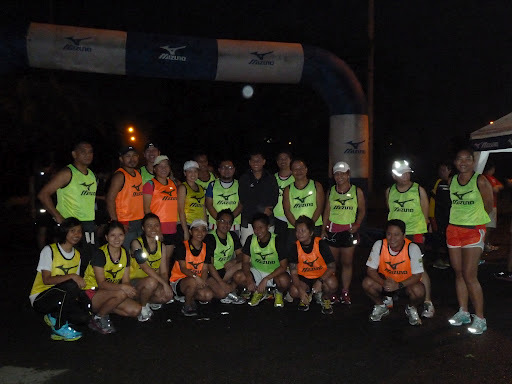 They asked, “Who are the sponsors for this run?” I knew the answer: Mizuno, Jump Start, GNC, Suunto, Gatorade, and Filinvest. 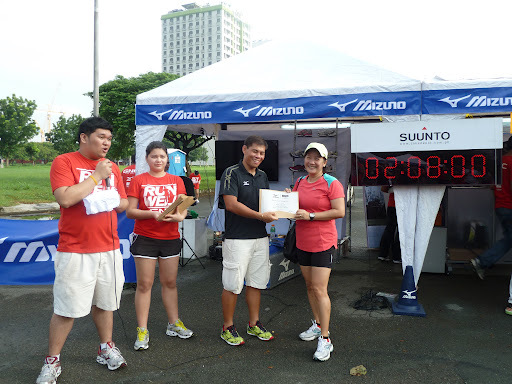 They gave me a prize – a Mizuno Philippine Football Federation jersey worth P2,000 (approx. US$50). 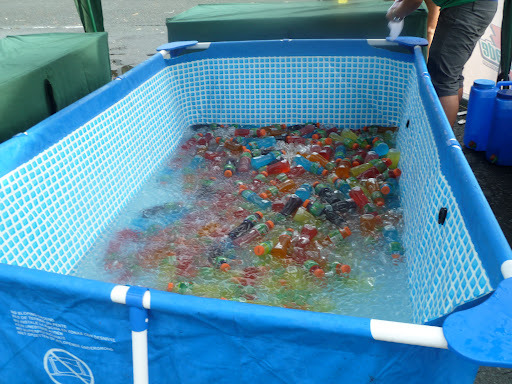 How cool was that? Several questions were asked and the prizes came from the sponsors. The biggest prize was a pair of Mizuno running shoes. The question was, “Where did Mizuno originate?” That girl who answered first ran so fast. Good for her! After that they gave us our certificates for module I – The Science of Running. Discover the key to efficiency and endurance. (POSE and Maffetone). 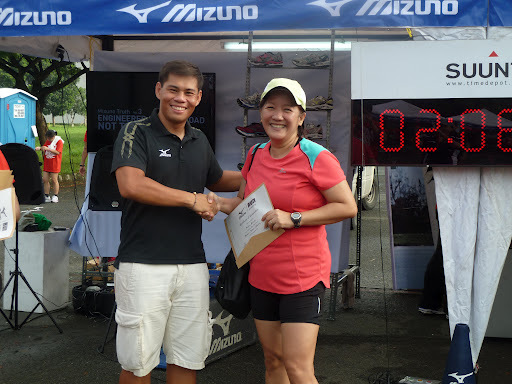 I am now a certified Mizuno runner! Yay! Congratulations to Mizuno, Coach Patrick and the graduates. 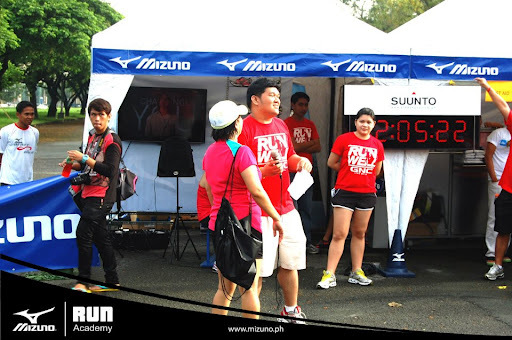 Read about my Mizuno RUN Academy posts here. *Thanks to my sister for the photos. Congratulations on your graduation! It looks like you had fun. Your photos have very good perspective. 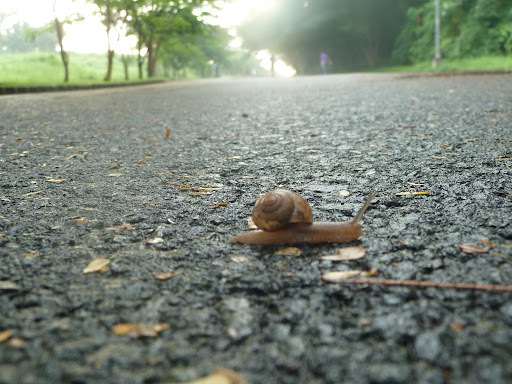 The snail and road photos are superb! Good work. Thanks. The photos were taken by my sister.